I have a special recipe to share with you all today! This past weekend I invited my mom over for a special Sunday dinner. I love having family over and preparing a tasty dish for them. So today I am sharing my Mozzarella Stuffed Meatballs recipe to my loyal readers. This recipe is a family favorite and this meal will surely fill you up! These meatballs are stuffed with oozy mozzarella cheese pearls and they are mighty huge meatballs! This Italian meatball recipe might just become a family favorite in your home too. There is a gluten-free option for my gluten-free readers. This mozzarella stuffed meatball recipe is the perfect meal to whip up in your slow-cooker. Once you do all of the work to prepare the meatballs it is smooth sailing after that. The meatballs should take about 15-20 minutes to create. 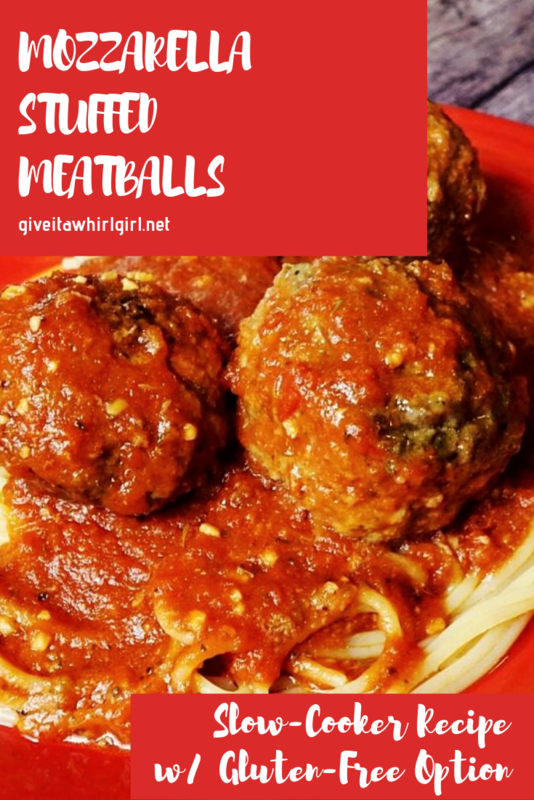 I have also included a pasta sauce recipe for these mozzarella stuffed meatballs, but you can feel free to skip that part and use the pasta sauce of your choice. I often avoid the jarred pasta sauces and create my own sauce with some crushed tomatoes. If you want a great jarred pasta sauce I highly recommend Rao’s. They make an excellent marinara and if you like bit of heat in your sauce, Rao’s has a fabulous Arrabiata Sauce. The best pasta to go with these mozzarella stuffed meatballs is the spaghetti noodle. You can go thick or you can go thin. We went thick! You have to have a great pasta sauce to go with your mozzarella stuffed meatballs. I have included a great pasta sauce recipe to go with the meatballs. The pasta sauce is simple and easy to create. If you want a sauce that tastes great you have to use good tomatoes. I used DeLallo’s crushed tomatoes and they were some of the best I ever had. Muir Glen is also another great brand to go with. And a blend of ground beef and ground Italian sausage is essential to this dish. The mix of meats is going to give you a flavorful, zesty meatball. Ground Italian sausage always lends awesome flavor to Italian pasta sauces. If you are following a gluten-free diet and still would like to enjoy this mozzarella stuffed meatballs recipe, simply swap the breadcrumbs out for some gluten-free breadcrumbs. You would then serve the meatballs over the gluten-free pasta of your choice. This recipe is for my famous mozzarella-stuffed meatballs... a family favorite! These hearty meatballs are stuffed with mozzarella pearls. When you dig into these meatballs you will love the oozing melty cheese! This is a slow-cooker recipe that serves approximately 8 people. Serve with the pasta of your choice. We love spaghetti noodles with this recipe! Use a large mixing bowl for the meatballs. Place all ingredients (except for the olive oil) for the meatballs into a large mixing bowl. Use clean hands to mix and incorporate all of the ingredients. Form large balls (approx 2 - 2 1/2 inches across) and stuff the meatballs with either one or two mozzarella pearls. Make sure the meatballs are tightly formed so the cheese does not melt out of them. Set aside the meatballs on a large cookie sheet. Warm two tablespoons of olive oil in a large saute pan. Once the oil has warmed place the meatballs in the pan and brown all sides of the meatballs. Set aside the meatballs while you prepare the pasta sauce in the next step. Warm a bit of olive oil in a saute pan and then add your minced garlic and diced shallots. Cook until translucent and fragrant. Add to the slow-cooker. Add the rest of the pasta sauce ingredients to your slow-cooker. Stir well. Place the meatballs in the slow-cooker and cook on low for 4 hours. Prepare the pasta of your choice. Spaghetti noodles work best with meatballs. Serve, eat, and enjoy your meatballs! If you are gluten-free, sub the Italian breadcrumbs for a gluten-free breadcrumb. Serve over gluten-free pasta. Mozzarella stuffed meatballs oozing melty cheese! These mozzarella stuffed meatballs were loved and enjoyed by all of us at the dinner table! You just can’t go wrong with a recipe like this. This recipe is a keeper! This is a fabulous meal to create when you have guests over for dinner. Because you use two pounds of meat to make the mozzarella stuffed meatballs there is a lot of food to go around! And these meatballs are huge! I could only pack in two of these gigantic mozzarella stuffed meatballs. How many will you eat? 3 might just be the limit with this dish. A lot of meat! Question Time! Do you have a family favorite recipe that you would like to share? I would love to hear all about your family favorite meal! This entry was posted in My Cooking Journey, Recipes and tagged amazon, DeLallo, grass fed beef, ground beef, ground italian sausage, instant pot aura, italian food, italian sausage, meatballs, pasta, pasta sauce, recipe, shopping, slow cooker, spaghetti, tomatoes. Bookmark the permalink. I like to make my meatballs ahead of time and freeze them. I am guessing these are able to be frozen and used later. Yes they definitely can. I actually did make these the day before I served them. I stored them in my fridge. Meatballs are definitely a family favourite, but stuffed with mozza? Whole new level! I’ve never heard of mozzarella pearls. I’ll have to try it this way! You could also use mozzarella cheesesticks cut up into pieces. I prefer using mozzarella pearls though. Depending on how big you make the meatballs you can stuff 1 or 2 in there. OMG! These look fabulous! Pinning for later!!!! I have been searching for a new meatball recipe for our collection and now this one looks so delicious. I’m so excited to give to a try. Looks good…I can’t wait to try it.